Kirby Bates Associates is a proud industry partner with The DAISY Foundation. The DAISY Foundation was founded by the family of J. Patrick Barnes who died at an early age from an autoimmune disease. The nursing care Patrick received when hospitalized profoundly touched his family. The primary purpose of the Foundation is to assist hospitals with an organized program of gratitude and recognition for the compassionate care provided every day by nurses in hospitals and healthcare organizations. Today there are over 2,200 hospital organizations in the US and 14 other countries who are members in the DAISY Foundation appreciation and recognition initiative. 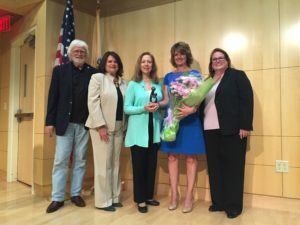 KBA had the wonderful opportunity to participate with Bonnie and Mark Barnes, the DAISY Foundation founders with visits to a number of hospitals in New Jersey. A special stop along this tour included The Valley Hospital in Ridgewood, NJ who was awarding its very first DAISY Award.